The little open boat at St David’s RNLI station is normally used to transport the volunteer crew to their Tamar class all weather lifeboat moored in the water whilst a new boathouse is being built for it. But lately it has had another use for a different occupant. 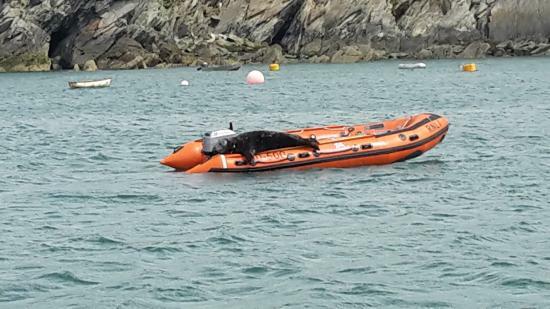 A bull seal has taken up residence, and spends the days stretched out in the boat sunbathing. He’s even been there when the boarding boat has been needed for a training exercise. Another favourite spot for the seal is on the Tamar’s mooring buoy – right above a “keep off” sign! The RNLI St David’s Coxwain, Dai John, said usually the seal slides off and swims away when the crew get within about 20 metres, but sometimes he’s more assertive. Then the crew has to work round him a little but, but he moves on pretty quickly. School summer holiday time and families off to the sea – but there’s danger out there. That’s why most beaches have information boards pointing out the hazards and how to keep safe at the seaside. That’s why there are RNLI Lifeguards on busy beaches, and why there are more than 340 RNLI Lifeboats on call to carry out rescues. People do silly things when they are by the sea. They jump off piers, breakwaters, and the like with absolutely no idea what is in or under the water where they will land. There may be jagged rocks; there may be obstructions like old ironwork from long-abandoned jetties; there may be strong currents in the water; the water itself may be very deep or, just as dangerous for dives or jumps, very shallow. 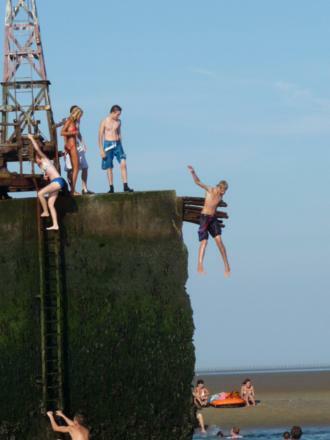 It’s nicknamed “Tombstoning” and it’s a mad and reckless thing to do. Here’s a warning from Southend-on-Sea RNLI, one of the very busiest lifeboat stations which operates three inshore lifeboats and a hovercraft – great for getting across that mile-and-a-quarter of mud when the tide is out. Just offshore from Thorpe Bay is part of the World War 2 Mulberry Harbour, which had to be abandoned there. It sticks up out of the water, and at low tide it can be easily reached from the beach. What’s more there’s a ladder up the side of it, just encouraging adventurers to climb on to it. Not just danger from reckless climbing and jumping though, but the long, shallow foreshore means the tide rises quickly leading to people being cut off, and, of course, those who get stuck in the mud. 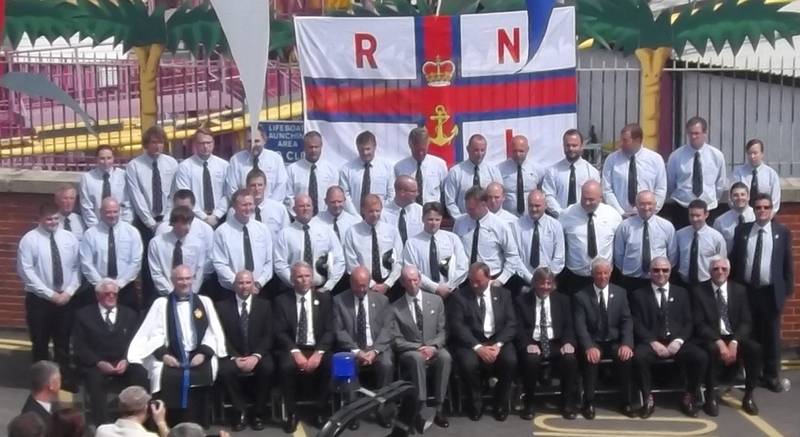 All of this means that this summer has been exceptionally busy for Southend RNLI. In the first seven months of the year the crews have been called out 90 times, almost as much as in the whole of 2014. Never Jump Off Piers, Breakwaters, River Banks, or Anything Else. You Simply Don’t Know What’s in That Water. When I was in Cromer recently, (my special lifeboat station), I was told there is a shortage of volunteers who are available at any time of the day. Now Coxwain John Davies, (of the famous Cromer lifeboat family which included Henry Blogg), has appeared on BBC Look East to talk about the problem. Cromer, he said, has a crew of 30 including shore helpers, and mans an All Weather Lifeboat housed at the station on the pier, and an Inshore boat housed next to the Henry Blogg Museum. But many of those 30 work on the rigs or in Norwich and are only available at certain times. 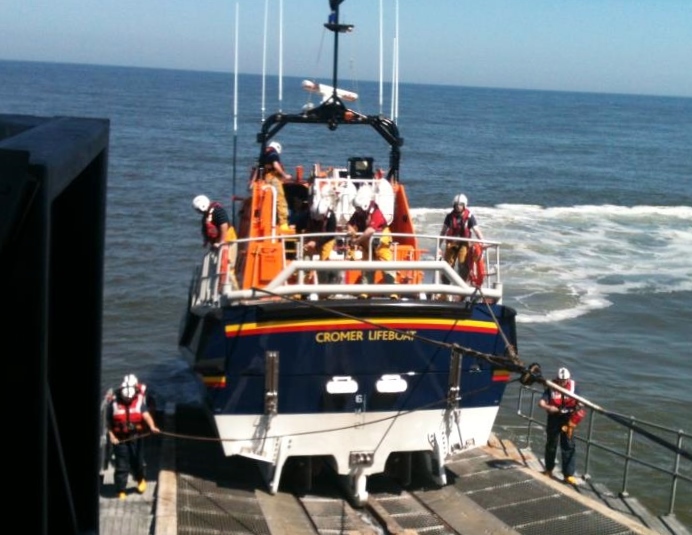 As he said, Cromer RNLI never has and never will fail to launch to a call, but they have had to sail with less than the regular number of crew on board. They need new volunteers not just for the lifeboat crews but as shore crew, fund raisers and Museum and shop helpers. RNLI lifeboats are provided by voluntary funding, and crewed by volunteers. Cromer station is looking for more. Could you help? Here’s the link to the Look East film on iPlayer, but it expires tonight. So she was delighted to read about the secret trip to Gretna Green by two of the Cromer Crew for their wedding. 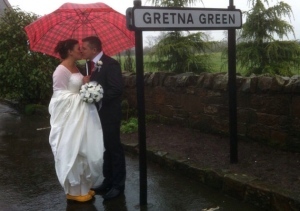 The bridegroom wore RNLI cufflinks and socks, and the bride wore her yellow wellies under her wedding dress! David Syer is a crew member of both the all weather and the inshore boats, and Rose Keating is a shore helper. 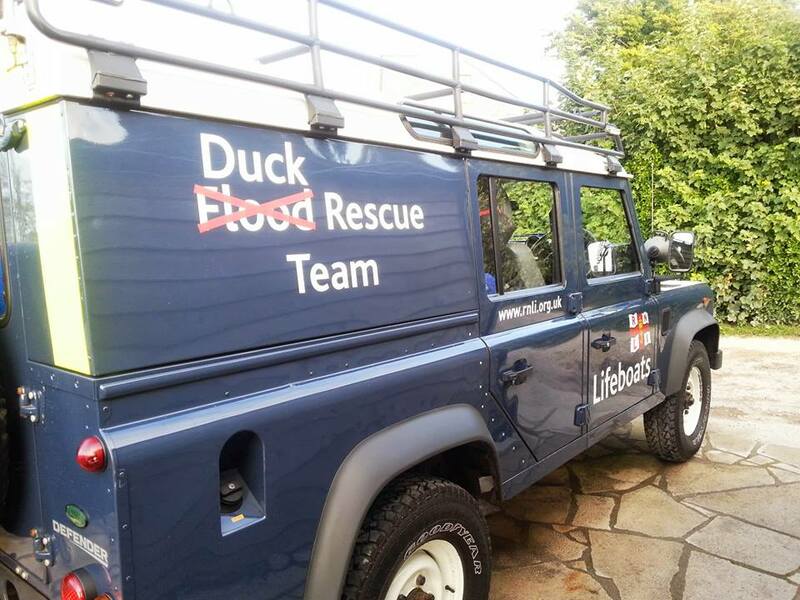 Station Operations Manager, Richard Leeds, said the rest of crew were surprised when the couple announced their news at the weekend’s crew meeting. They are the first married couple to serve on the station crew. “It’s great and everyone is really happy for them, but we hope they have re-run in Cromer because we missed out,” he said. Here’s the link to the story on EDP24. 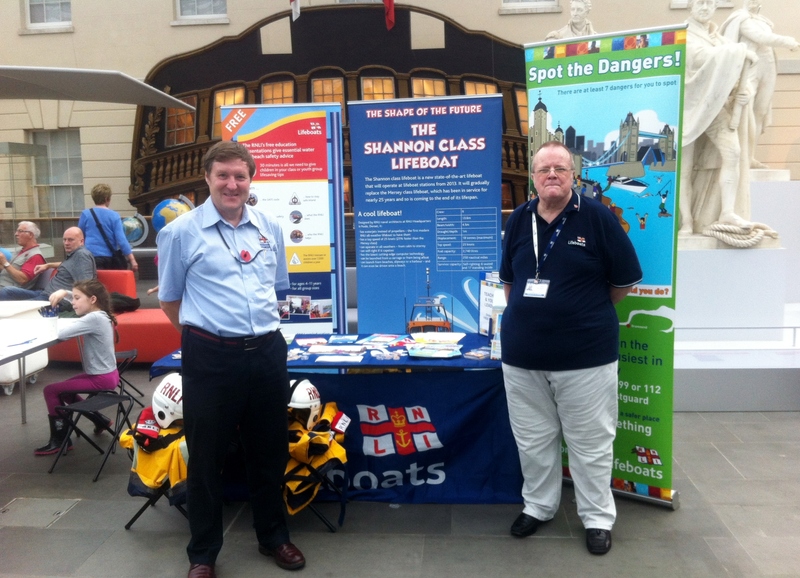 During half term the RNLI had a stand at the “Ships, Clocks and Stars” exhibition at the National Maritime Museum, Greenwich. The exhibition, which runs until January 2015, marks the 300th anniversary of the passing of the Longitude Act in July 1714, and tells the extraordinary story of the race to determine longitude (east-west position) at sea, helping to solve the problem of navigation and saving seafarers from terrible fates including shipwreck and starvation. It includes the original Longitude Act of 1714, on public display for the first time ever, and a rare opportunity to see all five of John Harrison’s now legendary timekeepers together, the first to allow accurate timekeeping at sea. Knowing that many families would use the opportunity of half term to visit the exhibition, the RNLI thought it would be an excellent chance to talk to lots of children and young people about the lifeboat and lifeguard service and how to keep themselves safe by water. 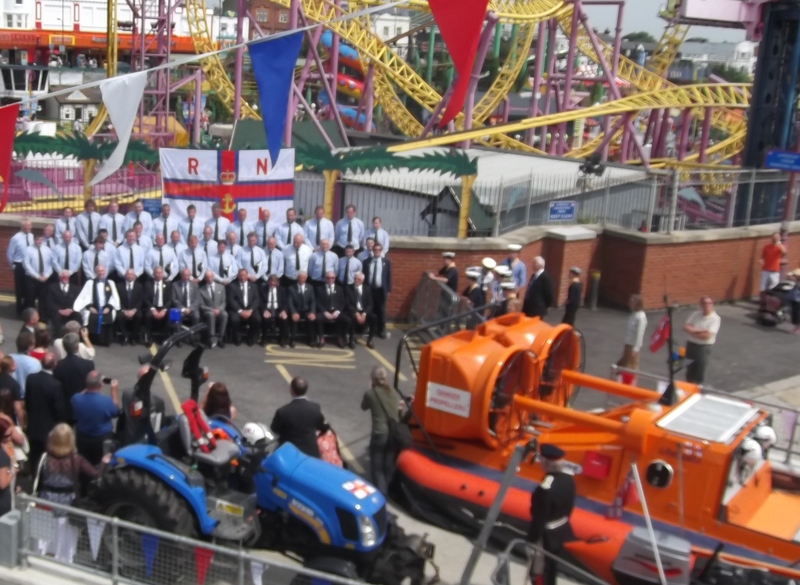 So the stand was shared by the Education and Heritage sections of RNLI. The stand had various projects for children to do, information, and the ever popular dressing up in lifeboat kit. Then there was a story-telling session which told visitors about the 1914 rescue when RNLI volunteers helped to save the life of 144 people on the First World War hospital ship, the Rohilla, which ran aground near Whitby on its way to Dunkirk to rescue soldiers. 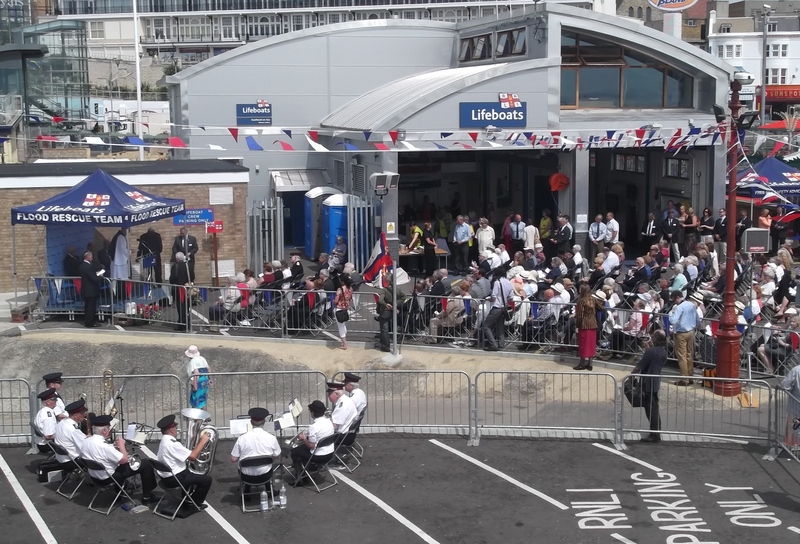 The RNLI stand attracted many visitors. There is a selection of photographs below, and here are John Partington and Tim Yeowell who were among those manning the stand. In 1914 RNLI volunteers helped to save the life of 144 people on the First World War hospital ship, the Rohilla, which ran aground near Whitby on its way to Dunkirk to rescue soldiers. As part of the centenary, on the 30th October the RNLI tweeted a re-creation of the day through the eyes of one of the survivors. 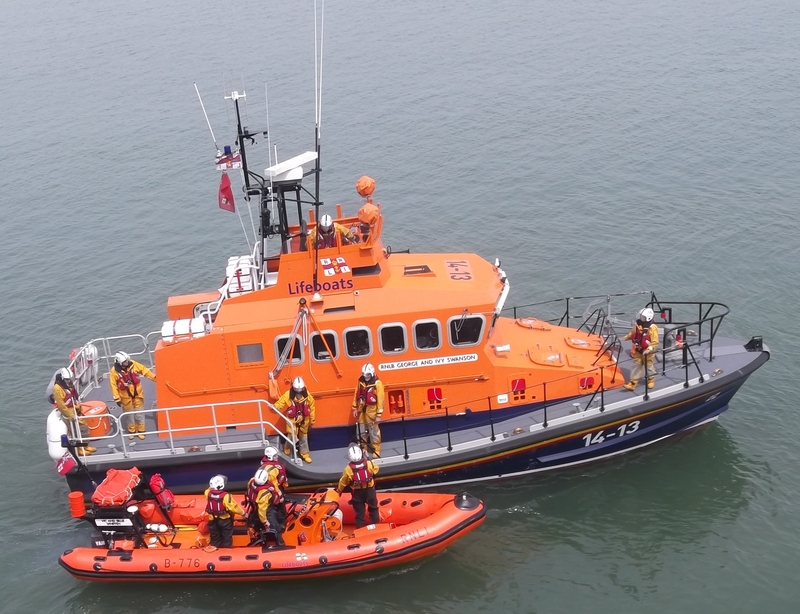 This weekend 15 boats, led by the Whitby RNLI all-weather lifeboat George and Mary Webb, sailed to the site of the wreck at Saltwick Nab to allow RNLI volunteers and the descendants of those who perished to lay wreaths and pay their respects. There was a short service of remembrance on board the lifeboat, transmitted by loudspeaker to the other boats, before the wreaths were lowered into the sea above the wreck. Also in the flotilla was the restored rowing lifeboat William Riley, which a hundred years ago was lowered down a cliff on ropes in an attempt to reach the Rohilla. 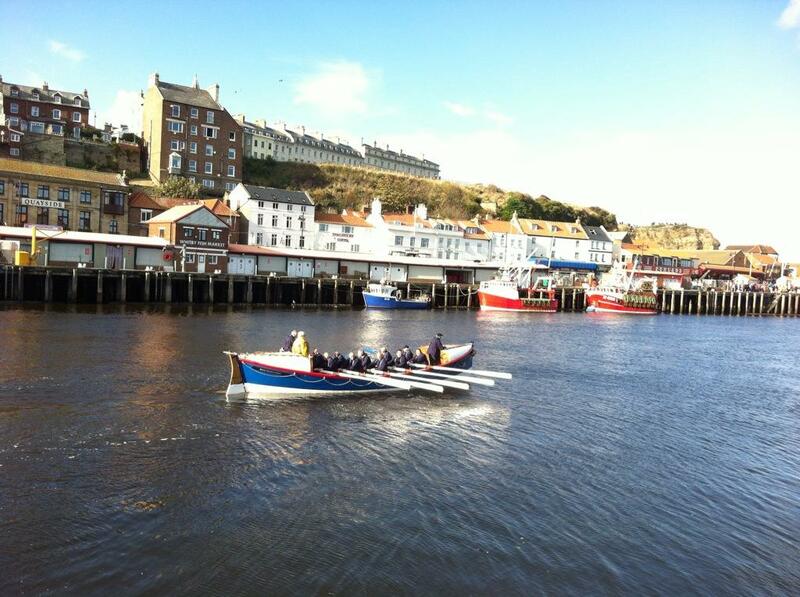 Earlier this weekend, the William Riley gave a rowing and rescue demonstration for the assembled crowds. 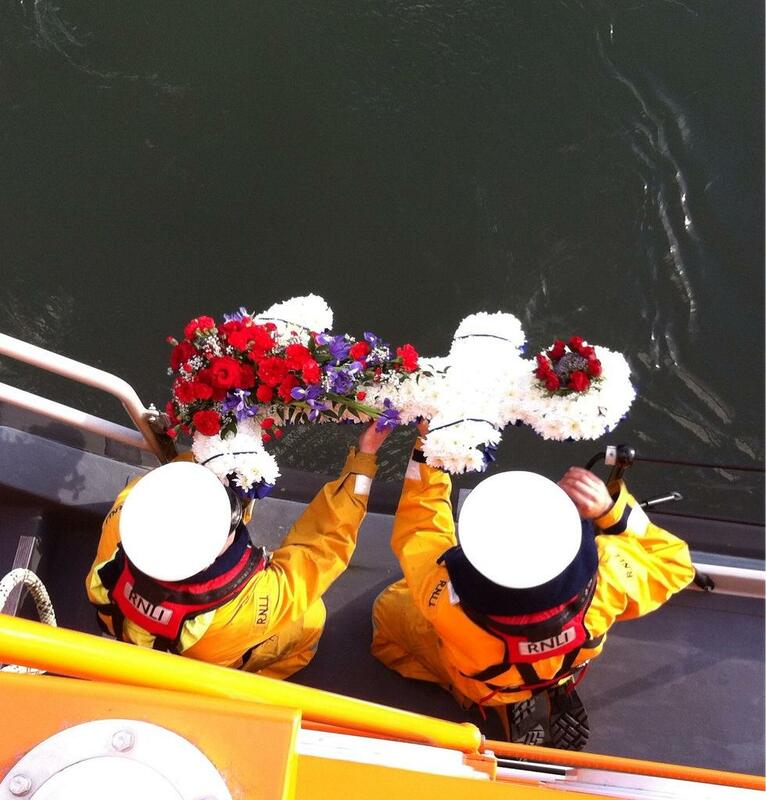 Below – Wreath laying from the Whitby RNLI in tribute to the Rohilla dead. The William Riley was one of six RNLI lifeboats which took part in the Rohilla rescue. Also involved was the new motor lifeboat Henry Vernon, which travelled from Tynemouth, and was the only vessel able to reach the last 50 survivors on board the stricken ship. People had been suspicious of motor lifeboats until then but this helped convince RNLI crews that they really were the future. Below – The heritage lifeboat William Riley on her way to give the demonstration of the rescue. The greatest boat race to grace the Thames is arriving in London this April, (and some teams from Oxford and Cambridge are up to something too). 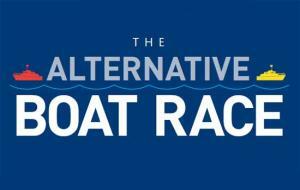 Before the Blues battle it out on 6th April, 250 model lifeboats will race along the tideway just upriver of the official Boat Race finish line in the RNLI’s Alternative Boat Race. And rowing clubs have been invited to take part by sponsoring their own lifeboat, decked out in the club’s own colours; while the entire race will be broadcast live on Youtube. All teams will keep their model Severn class lifeboat after the event. The Race will take place on the River Thames beside Kew Gardens, between Brentford Marina and the London Apprentice pub, London, TW7 6BG. It’s on 6th April 2014, from 3.00pm to 3.30pm. There’s no entry fee to take part, but clubs are asked to raise a minimum of £1,000 which will be split between the RNLI and the club. The club that raises the most money will win a master class with 2013 World Rowing Championship bronze medallist Adam Freeman-Pask. The money raised for RNLI will help support the lifeboat stations on the Thames in London, which are amongst the charity’s busiest. The volunteer crews rely on the public’s support to make their 700+ launches a year possible. The target for the event is £125,000 and that’s enough to keep a Thames lifeboat station ready and running 24-7 for three months, or to give 100 crew members all the personal kit they need to stay safe afloat. I’ve just found these photos from last summer, and realize, having checked, that I didn’t post them on here. 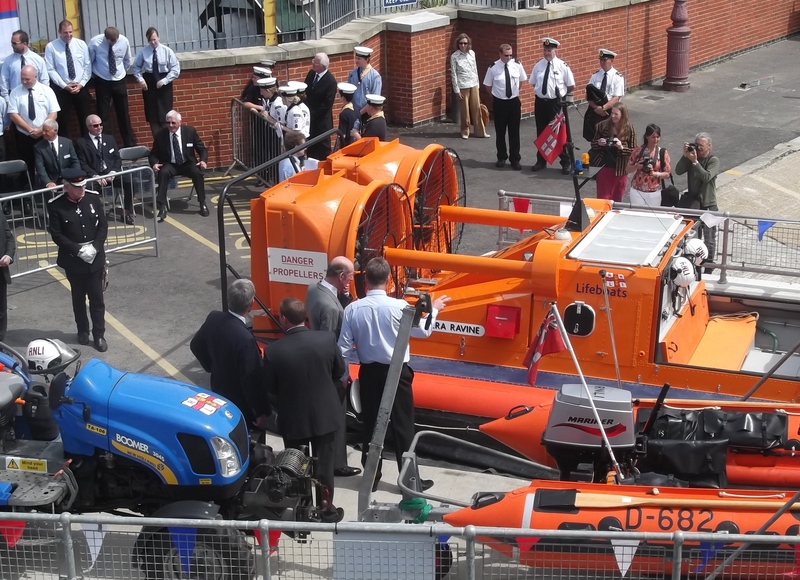 It was a very special July day when HRH The Duke of Kent, President of RNLI, came to Southend-on-Sea to open the splendid new shore-based Lifeboat Station. This will supplement the station at the end of the longest pleasure pier in the world, and provide a better home for the hovercraft and better crew facilities. and had the statutory photo taken with the crew, a large number as together they man three inshore lifeboats and the hovercraft. Then we all, including the Duke, got on the train and went the one-and-a- quarter miles to the end of the pier where he watched a display be one of Southend’s ILBs and a visitor in the shape of the all weather lifeboat from Sheerness, which had come across the estuary to take part. It was from the deck of the Sheerness boat that the hapless “volunteer” got pitched into the sea for the “man overboard” exercise. Then it was back on the train to the shore for the farewell to the Duke, and for me to buy my Rossi ice cream, as I always do when I am in Southend – the best ice cream in the world! Southend is the busiest coastal RNLI station. Only the Tower RNLI station on the Thames is busier, and sadly that is mainly because of all the people who threaten to jump off the London bridges. And at Southend, in quiet moments, the crew could just nip over the wall and have a go on the rides at Adventure Island! It was an excellent day made even better by warm sunshine. Unlike the last time I was at a similar event when the Duke named the Walton & Frinton Tamar. That was the summer too, but I have never been so wet and so cold! How about this for a lovely bit of lifeboat design and build.? RNLI is holding a competition this summer for Sandcastle of the Week. This week’s winner sent in this picture of a lifeboat launching from a sandy boathouse complete with slipway. It was chosen by South Devon Senior Lifeguard, Kate Berridge, who tells us a bit about her life as an RNLI lifeguard – follow this link. 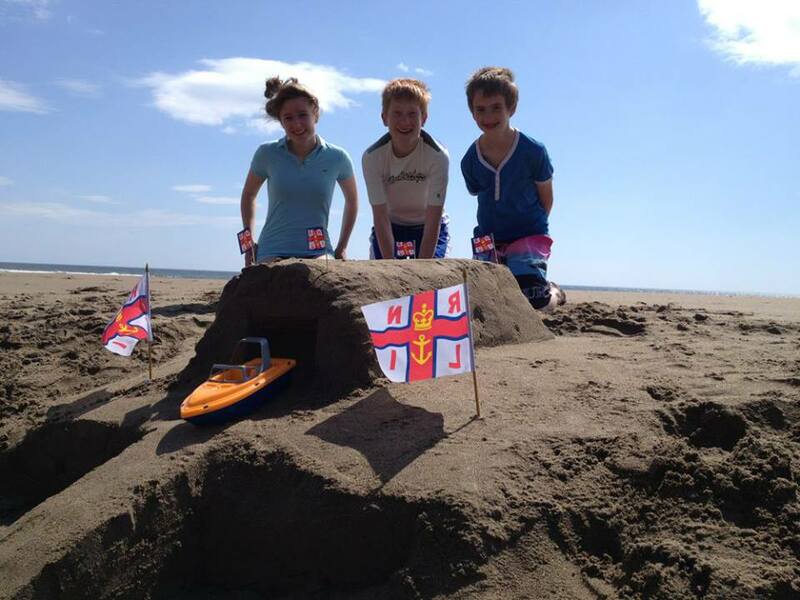 And if you want to enter a sandcastle photo in the competition you could win a stay at the RNLI College. Gosh those boys and girls at Cromer RNLI are good. 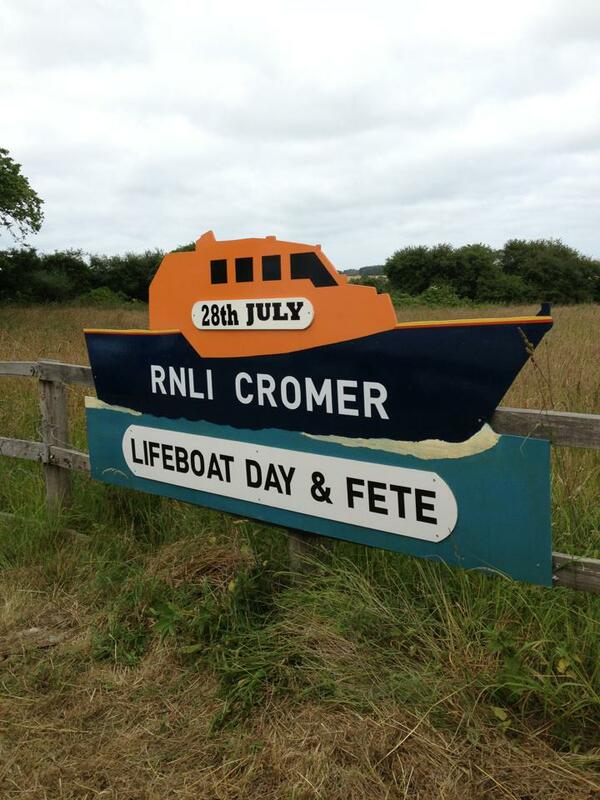 Lifeboat Day is coming up on 28th July, and they’ve made these lovely signs to advertise the event.